July 24, 2010 was one of our busiest days. We had over 670 visitors explore our museum and join us for our first Family Fun Day sponsored by PNC Foundation Grow Up Great Initiative. Our visitors received free admission, planetarium shows, train rides, art activities and much more. We had some wonderful volunteers from PNC Bank, who graciously helped all our guests make their own world or baseball figure. This day was a non-stop excitement filled day. One of the stations was Baseball speed throwing. This station allowed our guests to throw a baseball and have their speed timed. One of our young visitors through the ball at 66 mph. Well Done! In addition we had several drawings for fun things like Tiger’s baseball tickets, Puppet Art Theater tickets and DCM t-shirts and mug. Congratulations to our winners!!! O. Oluwole, M. Smith, and N. Ferreira. We are looking forward to seeing all of our visitors again soon. Join us next month for the “Dog Days of Summer” Aug. 1-31. 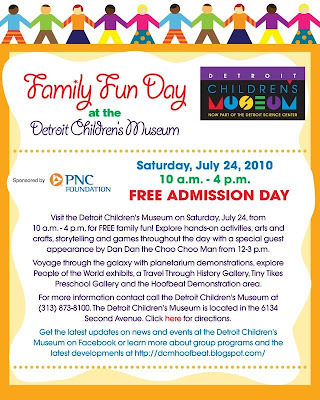 "Thursday, July 23 marked another first for the Detroit Children’s Museum. One of our youngest visitors was here with her family. She was very excited about all the kites, animals and preschool area. In fact, she was so excited that she let go of her Mom’s hand and took her first steps on her own. It was just a few at first and by the time she left she was up to 10 at a time. We are very honored that she choose our museum to launch her walking debut." New Joint Membership Program Includes Both the Detroit Children's Museum and the Detroit Science Center! There's never been a better time to discover the wonders of science and hands on exploration in Detroit! The Detroit Children's Museum and the Detroit Science Center are now covered under one membership! A Family level membership gets two adults and all children in the household under 18 into both museums for one year for only $70! More information and other membership levels and benefits here. You can purchase your membership online via PayPal here. Have any questions? Contact the Membership Department at 313.577.8400, ext. 433, or by e-mail membership@sciencedetroit.org.